These histories are far from complete. They are being assembled as I gather information from a variety of sources (that don't always agree with each other). Many thanks to Richard Cains for much of the data. shown at "Moving People in Cities" exhibition at Traffic Road Research Laboratory. 7/72 RG to AEC, briefly..
6/78 HH ..change store (Hemel Hempstead)..
8/74 HG repainted in Superbus livery..
converted to sales bus, labelled "Infomotion"
10/98    Rally Control for Cobham RF Running Day. 3/78 HF transfer into store..
1/73 DG into service on 402/431/493 (Dunton Green)..
5/76 HG from repaint: in store (Hertford)..
fitted with 17 coach seats from RS38 at rear. 7/79 HH in store (Hemel Hempstead)..
LNB34           7/77 RE reclassified as bus..
LNB35           7/77 RE reclassified as bus..
LNB36           7/77 RE reclassified as bus..
LNB37           7/77 RE reclassified as bus..
LNB38           7/77 RE reclassified as bus..
6/79 DFS in store (Dorking)..
10/76 DG loan (Dunton Green).. Preserved ex-LNC42 at Showbus 2009 in Tanat Valley livery. LNC45 in Dover Docks livery, at Showbus Duxford, September 2005. 3/73 TG transfer, trainer (Tring)..
4/73 HG ..transfer into store (Hertford)..
6/73 GR transfer into store (Garston)..
11/78 CW to Crawley Works..
LNB 48          6/73 RG in store, reclassified as bus..
5/73 TG into service on 706 (Tring)..
5/73 RG ..return to store..
5/73 DS ....change store (Dorking)..
5/73 LH ......change store again (Leatherhead)..
5/73 RG return to store..
5/73 CM ..transfer, trainer (Chelsham)..
LNB54           6/73 RG change store: reclassified as bus..
5/73 LH ..into store (Leatherhead)..
5/73 TG ..into service on 706 (Tring)..
3/76 SV change store (Stevenage)..
5/73 DG change store (Dunton Green)..
LNB58           6/73 RG change store: reclassified as bus..
6/73 DS ..change store (Dorking)..
12/76 RE transfer into store (Romford)..
5/73 LH change store (Leatherhead)..
12/76 DG loan (Dunton Green)..
5/73 CS change store (Chiswick)..
LNB64           6/73 DS change store (Dorking)..
1/89    allocated to County Bus..
LNB65           6/73 DS reclassified as bus: change store (Dorking)..
7/95 GF rebuilt to Urban Bus spec: "Son of Greenway"
Preserved Alder Valley 251 at Dorking Running Day, August 2003. 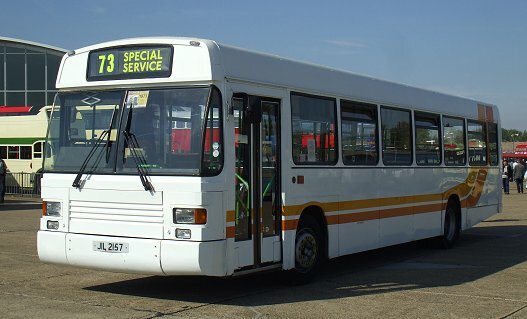 8/95 CY recycled to Urban Bus specification: "Son of Greenway"
4/95 GF refurbished to Urban Bus spec: "Son of Greenway"
Refurbished to Urban Bus Spec: "Son of Greenway"
7/94 HA withdrawn into store..